Checking your weight is something we all do (especially around this time of year). Most scales will tell you a simple number, and leave you to your own devices past that. Seeing that there are now all sorts of fitness and health apps, gadgets, and gizmos, it seems only fair that bathroom scales pick up the pace. 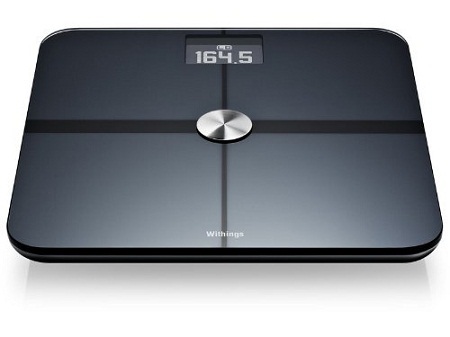 The Withings WS-50 Scale will do far more than just tell you a number. This will tell you weight, BMI, and your body fat. It can store information for up to 8 different people, and can pair up with over 60 different apps, so you might be able to use one you’re already acquainted with. Of course, this isn’t all it can do. Having fresh air in your living space can do a lot for your health, so this scale is constantly checking the the quality of the air you’re taking in. It will also tell you if you favor leaning on one side rather than the other, meaning you need to improve your posture. This is also capable of checking your resting heart rate, and can tell you if you’re doing any better over time. It does have Bluetooth and Wi-Fi capabilities, and will cost you around $150. This will work on Android or iOS, so no one should be left out (well, mostly everyone anyhow). This is a great first step in tracking your fitness improvements, and will hopefully make the process a little bit easier.